I will not need go into the historical background on the evil of slavery as Charles Chukwuemeka Oputa aka Charly Boy has revealed through his article the true definition of a happy slave, who takes pride in baking his master’s cake. I always tell people that slavery is still in existence but some tend to believe that slavery is now obsolete and remains in the past. Charly Boy is a classic example of a happy slave that has gotten to the stage of feeling very comfortable even while in chains. A happy slave is not chained on his hands or legs but mentally chained. It is very difficult for the happy slave to rebel against his state of slavery because his mindset has been chained and controlled by the master. The happy slave follows the dictates of the master without sparing a thought for his own wellbeing. Slavery has been modernized and has become subtle, such that someone can be a slave without even knowing it. If one is unable to speak or fight back against the killing, humiliation and suffering of his people, then that person must be a slave. 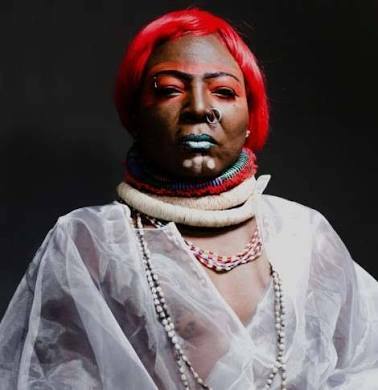 It is unfortunate that Charly Boy has been anesthetized by the Nigeria government through contracts and endorsements. He has been influenced by the wayward lifestyle he lives in Lagos and he believes he is a free man but he remains a slave. After going through his write up about the quest for the restoration of Biafra, I realized that Charly Boy is suffering syndromes of slavery. He is asking the people of South east to go back home and develop it and forget about the restoration of Biafra, it is unfortunate that someone who supposedly studied in the US is trying to ‘Igbonise’ the quest for the restoration of Biafra. Charly Boy said he was 17-year-old during the Biafra Genocide of 1967-70 and undoubtedly a child of age seventeen during the extermination of his people should have vivid memories and I want to ask him these: Did the bombing and starvation of Biafran civilians occur only in Igbo land? What part of the South east has Charly Boy developed since he is one of the “Igbo Lagosians” who prefers to develop Lagos state. The scale is staggering, as men who are supposed to stand and fight for their freedom are trapped in slavery and made to believe that their investment is the reason they must remain chained. Charly Boy also said that the youths of Biafra anchoring the restoration of Biafra have failed to follow history on the death of over 3.5 million Biafrans killed during the genocide, he stressed that hunger was used by the Nigeria government as a weapons of war and killed more BIafrans than did bullets. Let me remind Charly Boy that during the second world war, the British people suffered death severely as German Adolf Hitler destroyed almost everything but then British Prime Minister Winston Churchill never gave up and that’s what brought about the freedom enjoyed in present Britain. Charly Boy should go and study about George Washington, the American that never gave up, not minding the death, hunger and smallpox disease that befell his soldiers. He should also take a peek at the history of South Africa that lost millions of her people in defense of their freedom. Charly Boy should spend more time in his father’s large library to gain enlightenment on history and law. Those who give up essential liberty to obtain a little temporary safety deserve neither liberty nor safety. It is high time happy slaves like Charly Boy and the rest exposed themselves to their deepest fear, because after that, fear will have no power over them and the fear of freedom will shrink and vanish. The youths of Biafra have decided to kick against the continuous slavery of their people, they have decided that no amount of subterfuge from the Nigeria government and her allies will stop the restoration of Biafra. It is already decided that it is better to die while standing against slavery than living and in chains. The death of over 3.5millions Biafrans during the genocide and the continuous killing of fathers, mothers, uncle, brothers and sisters because we seek our right to self-determination is the main reason we shall continue to seek for our freedom.